Dr. Heather Mack was born and raised in Pennsylvania surrounded by nature and animals. She always wanted to become a veterinarian and to move out West. She began riding horses at 9 years old and they are still her #1 passion. When she is not busy with her Equine Sports Medicine practice you will find her playing with her own horses, exploring the wilderness or refining her riding and horsemanship skills. Heather was one of the first women accepted at Columbia University in NYC and received her B. S. there. She spent one year in Great Britain studying Veterinary Science at the University of Bristol in Langford, U. K. She graduated from the University of Pennsylvania School of Veterinary Medicine in 1991. In the early 90’s she received certification from both the International Veterinary Acupuncture Society (IVAS) and the American Veterinary Chiropractic Association (AVCA). She began her studies of Traditional Chinese Medicine and Acupuncture in 1985 with Dr. Kenny Gong while attending Columbia College. Heather has been on a continual path of studying alternative medicine since then. 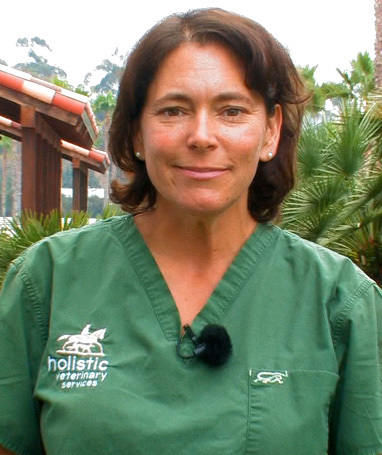 Dr. Mack teaches Balanced Mouth Dentistry and Holistic Horse Health at Balanced Equine Wellness. She has a particular interest in balancing the mouth to affect a positive change in the Temporo-Mandibular Joint (TMJ). She considers the TMJ the “Master Link” in the chain of the horses’ balance. It is a powerful convergence point for many acupuncture meridians. Also, it is the closest joint in the body to the brain and brainstem so harmonizing the proprioceptors in the jaw can have huge effects on the entire body. Part Two of a series that sheds light on the often overlooked Temporo-Mandibular Joint. In this video Dr. Heather Mack describes and demonstrates her approach to equine dentistry, with an emphasis on restoring biomechanical function & comfort to the TMJ. Part Three of a series where Dr. Heather Mack sheds light on the often overlooked Temporo-Mandibular Joint. The TMJ is a very significant convergence point for the acupressure meridians. In this video she discusses a syndrome she encounters often in her practice - the connection between sore TMJs and sore hips. Part One of a series where Dr. Heather Mack sheds light on the often overlooked Temporo-Mandibular Joint. She explains its biomechanical significance, how to recognize TMJ discomfort in your horse, and what can be done to alleviate TMJ related issues.